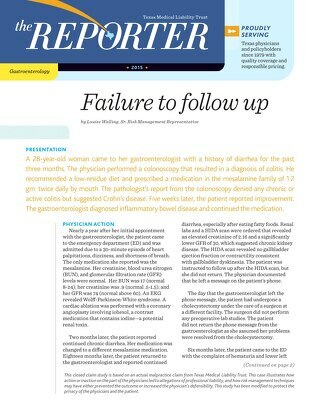 A 28-year-old woman came to her gastroenterologist with a history of diarrhea for the past three months. The physician performed a colonoscopy that resulted in a diagnosis of colitis. He recommended a low-residue diet and prescribed a medication in the mesalamine family of 1.2 gm. twice daily by mouth. The pathologist’s report from the colonoscopy did not report any chronic or active colitis, but suggested Crohn’s disease. Five weeks later, the patient reported improvement. 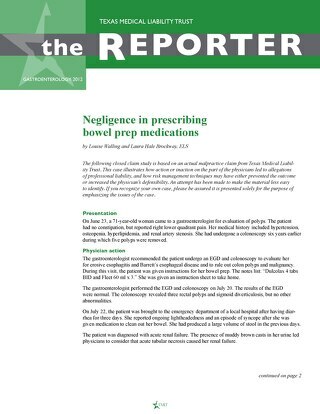 The gastroenterologist diagnosed inflammatory bowel disease and continued the medication. Nearly a year after her initial appointment with the gastroenterologist, the patient came to the emergency department (ED) and was admitted due to a 30-minute episode of heart palpitations, dizziness, and shortness of breath. The only medication she reported was the mesalamine. Her creatinine, blood urea nitrogen (BUN), and glomerular filtration rate (GFR) levels were normal. Her BUN was 17 (normal 8-24); her creatinine was .9 (normal .5-1.5); and her GFR was 74 (normal above 60). An EKG revealed Wolff-Parkinson-White syndrome. A cardiac ablation was performed with a coronary angioplasty involving iohexol, a contrast medication that contains iodine—a potential renal toxin. Two months later, the patient reported continued chronic diarrhea. Her medication was changed to a different mesalamine medication. Eighteen months later, the patient returned to the gastroenterologist and reported continued diarrhea, especially after eating fatty foods. Renal labs and a HIDA scan were ordered that revealed an elevated creatinine of 2.16 and a significantly lower GFR of 30, which suggested chronic kidney disease. The HIDA scan revealed no gallbladder ejection fraction or contractility consistent with gallbladder dyskinesia. The patient was instructed to follow up after the HIDA scan, but she did not return. The physician documented that he left a message on the patient’s phone. The day that the gastroenterologist left the phone message, the patient had undergone a cholecystectomy under the care of a surgeon at a different facility. 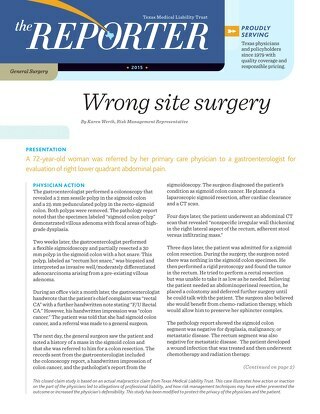 The surgeon did not perform any preoperative lab studies. The patient did not return the phone message from the gastroenterologist as she assumed her problems were resolved from the cholecystectomy. Six months later, the patient came to the ED with the complaint of hematuria and lower left back pain. After a work up with a hospitalist, internist, and nephrologist, a CT scan showed a large left kidney hematoma and numerous right kidney cysts. Her kidney labs were BUN 65; creatinine 5.6; and GFR 9. She received a blood transfusion for anemia. A kidney biopsy report noted severe chronic tubulointerstitial nephritis (TIN). When commenting on the renal biopsy results, the hospital nephrologist’s documentation questioned if the patient’s use of mesalamine medication was a precipitating factor. The patient was referred to a nephrologist for evaluation of a possible kidney transplant. She was diagnosed in stage 5 chronic kidney disease and began monthly treatments with the nephrologist. The last known status of the patient was that she was still on the waiting list for a kidney transplant. 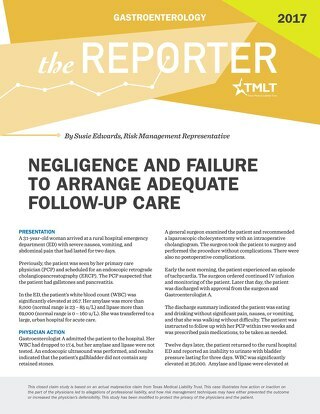 failure to provide follow up care when lab results indicated renal insufficiency. The majority of the physicians and experts who reviewed this case agreed that renal function studies should have been obtained before starting the mesalamine medications and that periodic monitoring should have occurred after starting the medications. Two of the defense experts were also critical that it was not documented when the medication was stopped. It was agreed that the biggest weakness was the failure of the physician to follow up on the abnormal renal labs. The physician left a message on the patient’s telephone telling her to call him; however, the patient did not understand the urgency of the call or her need to reply. One expert commented that if renal failure is promptly recognized and the offending drug is discontinued, the kidneys usually recover. When the renal failure is not addressed and the medication therapy is continued, the injury is often irreversible. This case was settled on behalf of the gastroenterologist. Part of an adequate medical record is to include the relevant risk factors. 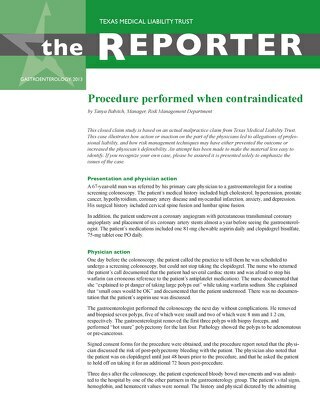 When a physician prescribes a high-risk drug with adverse side effects, it is warranted to document that the informed consent discussion took place with the patient, that the patient’s questions were answered, and that the patient either agreed to proceed or not to proceed. In this case, a written informed consent may have been justified. 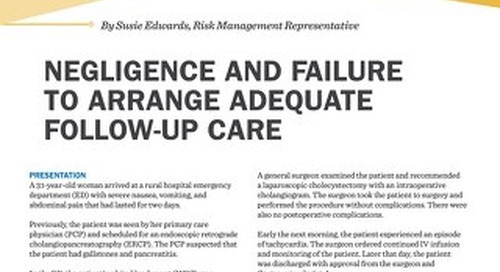 Patient safety encompasses that the patient makes an informed decision. The physician’s plan of care did not include obtaining initial kidney function lab studies prior to the prescription of mesalamine medications and following up with periodic monitoring. Good risk management would include this in the treatment plan, with proper notation and follow through with the patient. Communicating diagnostic and lab study results to patients is a challenge for any practice, but it is crucial. In this claim, the patient wrongly concluded that her problems had been addressed by another physician at a different facility. 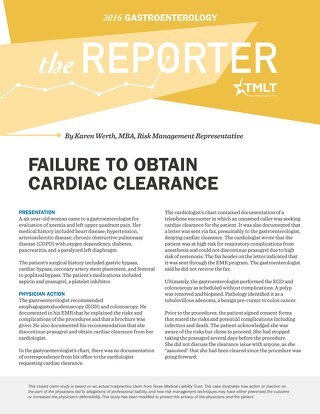 Implementing a system for tracking diagnostic imaging and labs is important to prevent a patient from slipping through the cracks, and to prevent an allegation of failure to follow up. As in this case, patients do not always keep their appointments. Therefore, it is important to not rely on communicating test results in follow-up appointments. Ensure patient test results are communicated by reaching the patient by phone or by sending the results by certified mail.